Here is a Tutorial about how to use EtherDelta. Unlike CoinBase or Binance, EtherDelta is a decentralized exchange platform, that means that you own your private key. EtherDelta is a Ethereum based ERC20 Tokens exchange platform. You will not need to register in here. You address and the private key will be given to you directly. Save them or write them down somewhere. To start, you will need a little amount (minimum 0.001 Ethereum) on your EtherDelta Wallet to pay transaction fees. Every transaction you do will cost a bit of Ethereum (usually between 0.0003 and 0.001 ETH). 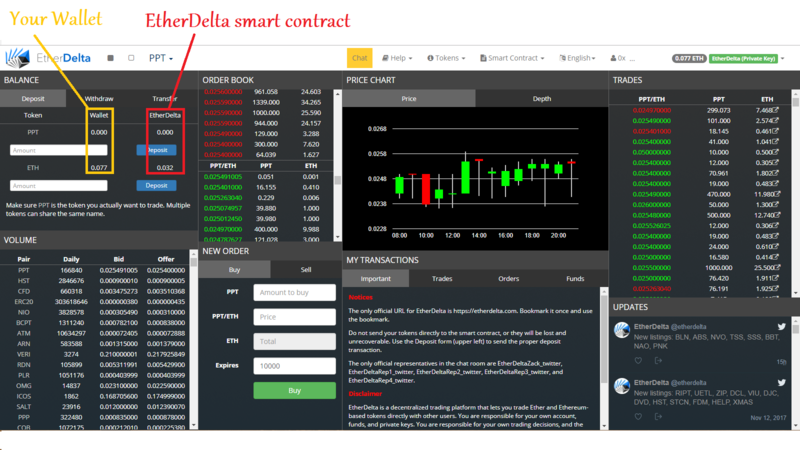 EtherDelta looks a bit hard to understand at first, but once you get it, it's really simple to use. You can choose on the top of the website the currency you want to trade in the list. You can manually choose to place a sell or buy order at the bottom under "New order". Or you can click directly on a sell or buy order in the "Order book". The last trades are shown on the right side. If the currency you want isn't in the list, you can go to the bottom of the list and click on "Others". 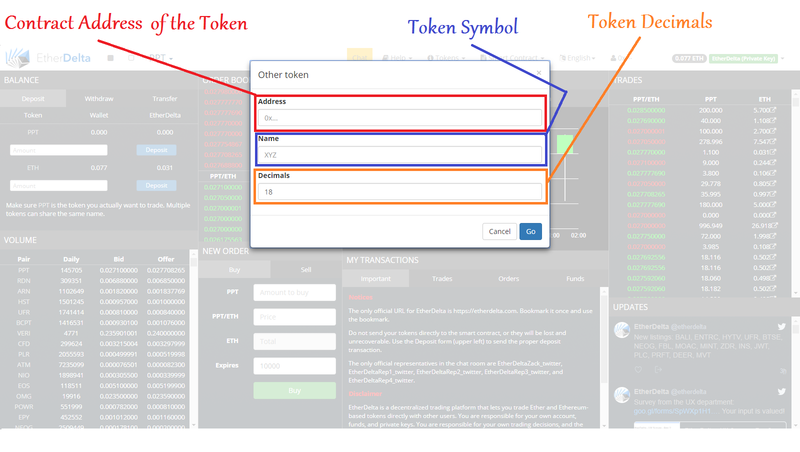 You will have to put the informations (Contract adress / Symbol / Decimals) to see the Token you want. The bottom line is for Ethereum. 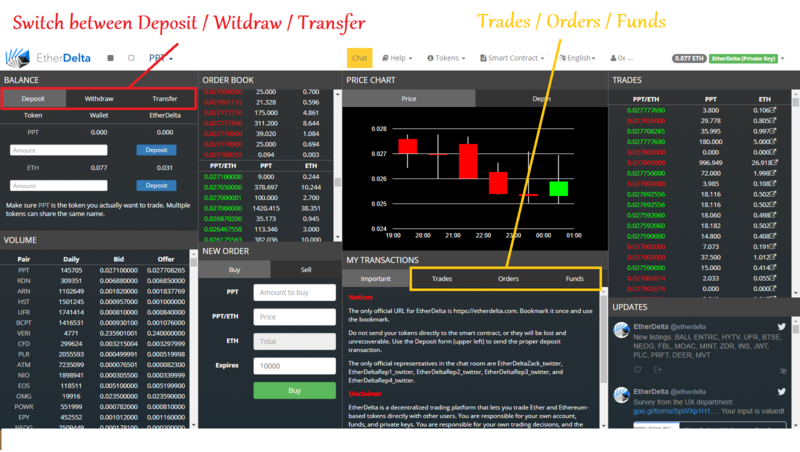 At the bottom, you can see your recent trades under "Trades", see or cancel your active orders under "Orders" and see your deposit/withdraw history under "Funds". To send Ethereum or Tokens from your address to the smart contract, use "Deposit". To withdraw Ethereum or Tokens from the smart contract to your address, use "Withdraw". To transfer Ethereum or Tokens from your wallet to another Ethereum wallet (like your MyEtherWallet for example), use "Transfer". I hope this little guide will help some people to understand EtherDelta a bit better !